Prestigious victory: President of the BTC Management Board Jože Mermal receives the lifetime achievement award for Best Manager 2016, the BTC Company takes home the Best Company Award • BTC d.d. 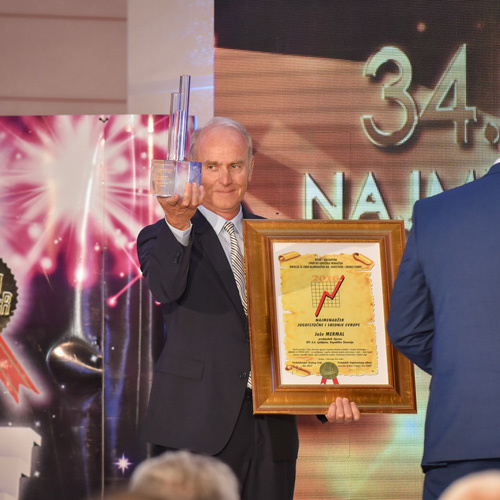 The award ceremony recognising the best executives and companies of Bosnia and Herzegovina, Southeast Europe, and Central Europe, brought to Sarajevo more than 400 entrepreneurs, public personalities, and politicians. The awards encourage business leaders to do good not only for themselves but also for the people around them. As such, the organisations also support the advancement of art, culture, and society in general. In the 20 years of its existence, the Best Manager award has become renowned for being a measure of success of managers and companies worldwide, especially because it is conferred exclusively on the basis of concrete results and has no ties to politics. The award was founded by the international community for the wider region together with domestic business associations and partners not directly involved in business. the BTC Company is a good partner to ambitious individuals and organisations, whose achievements reverberate at home and abroad. It is the co-founder and supporter of the centres for innovation and entrepreneurship ABC Accelerator and ABC Hub, thus contributing to the global business narrative. As a creator of opportunities for present and future generations, BTC is realising its vision of an open dialogue society and contributes to the economic development of Slovenia. The Independent Agency for the selection of best managers was founded in 1995. It has been choosing the best representatives in all fields of business for more than twenty years. The award was first given only to managers in Bosnia and Herzegovina. However, the project soon expanded and has now included the best managers of the entire region of Southeast and Central Europe for the 18th year in a row. Every year, the jury receives more than 2,000 nominations promoting European managers and other successful personalities. You can find out more about the awards at the agency’s website.